Good Job!! !I think this should be one of the best blogs that i have ever read in terms of its content and the treatment of the subject. This is an eye opener. I was able to relate to this blog of yours through an incident that happened to me. I happened to talk to one of our family friend(his family has been in tvm from the time of moolam thirunal easily more than 100 years). It was the time when IIST land allocation had ran into some rough weather and it was the same time the Smart city agreement was about to signed. I think the so called most circulated malayalam news daily had carried news item which did not give IIST a chance and there was major news which talked about the kind of benefits that Kerala is going reap when smart city project would become a reality et all. During my discussion on this topic with him, i happen to realize that how people get brain washed over hyped media news items. He was certain that IIST would not come up in TVM and more over when i happen to tell him the fact Technopark 1-1V + Technocity would be the largest employer in the state, he never believed it. I think this incident opened my eyes on how much the people have been brain washed in our state by this media. 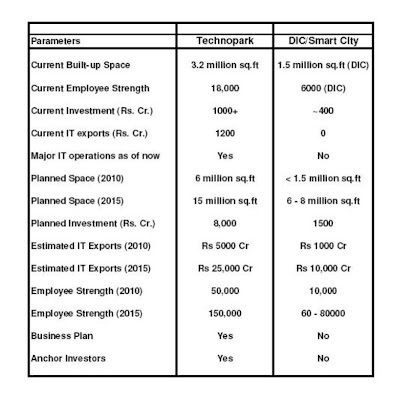 TVM's very own People dont know that technopark is bigger than anything else that had happened in our state and will remain the bigger for time to come. People have no idea about the potential the vizinjam port has. People dont know how good is their own back yard. I will be happy if i can play some role in making people aware of thr truth. I thank you from bottom of my heart for the kind of efforts that you are putting for this cause. To Sum up. This gross illtreatment that people of tvm has to put up with should be more than a huge motivation factor for us to protest and revolt against this oppression. I feel that its worth being a naxalite to champion the cause of of tvm development. When people are robbed of their right, then i would say it is fair to fight for your right in what so ever way violent or non violent. Finally it was wonderful reading it and As i have always maintained i think these blogs find its way into some news paper or news magazine, it would help our cause better. 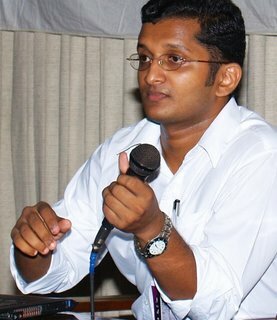 The problem I found with Trivandrum people are they are too much oriented to politics, bureaucracy and controversies. The main focus is what goes on in Secratariate, Cliff House, AKG Centre, Indira Bhavan and so on. No one knows whats really happening in Technopark or Vizhinjam, leave alone in other part of Kerala. or Even the youth are not much aware of the development issues, for which, the real blame has to be put on our idle media. "So it doesn't matter that the pilot on your next flight has 5000 hours of experience and his plane is packed with millions of dollars of safety features, while your driver (maybe a younger sibling) has just peeled off the big, red "L" board from your car, which was its only safety feature in the first place!" excellent manner of driving a point home. so well written!